← Need for speed anyone??? I remember my first triathlon…. It was an HSBC Tri a Tri in Toronto at Cherry Beach. I could hardly swim, but luckily it was only 400m and a staggered start. When I finally emerged from the water I was so happy to have survived the swim that I was smiling from ear to ear. The run up Cherry beach is rock and I hobbled up tender footing it all the way. I tore off my goggles and cap and ran to transition. When I finally made it to my bike my wetsuit slipped off easily, like a pro. Ayesha had given me the valuable tip of using Vaseline on the outside of the ankles and wrists of the suit so that it slid off easily. After that, thinks started to get sticky. I didn’t have a tri suit, so I had to put on a bike my jersey before I could start the bike. The combo of my wet body and my small bike jersey made it impossible to pull on the jersey. It rolled up on my back and I couldn’t pull it down. I must have spent 5 minutes trying to get my shirt on. Eventually, the jersey finally did get on, but I swear it was more tiring than the swim. My slow transition didn’t deter me from blowing past people the whole bike and run in the rest of the tri. I took no prisoners in my and pummeled the old, the young and the happy go lucky. 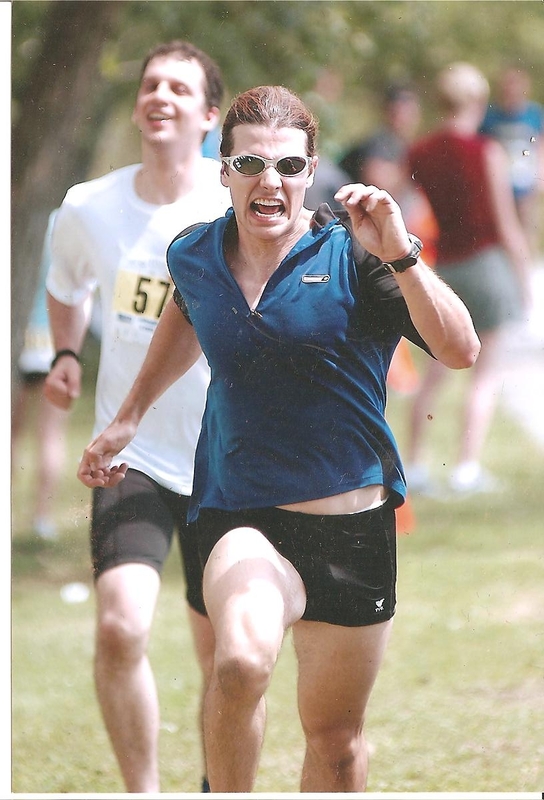 I took it more serious than most, as the pic at the finish of my first tri below illustrates. I was DETERMINED! Most of us spend hours training to improve our swim, bike and run, but spend little or no time practicing our transitions. You could easily take minutes off your time with a little practice and preparation in the transitions. Anyhow, point is that I had a terrible first transition, but I’d like to be able to help others so that they can benefit from my experience. I will be running 2 transition clinics with the help of Ayesha Rollinson. Both are free of charge and both will start from the Trek Bicycle Store of Toronto, 2063 Yonge Street. No need to register just show up, details below. This clinic will focus on what you need for and how to set up your transition space to efficiently allow you to move from one event to the next. This clinic will share with you the tricks that the top athletes use to take seconds off their transition time. You’ll learn how to do a flying mount from the swim to bike and how to get out of your bike shoes on the bike and get off running. You will need your bike, helmet and bike shoes for this one. you are an inspiring dude, Mr. Mike M.! i will try to run a little harder in my next half-marathon.